Whether you’d like to grow your own fruit and vegetables or simply have a beautiful outdoor area to enjoy, a personal garden is a must for many homeowners. What, though, if you have limited space to work with? 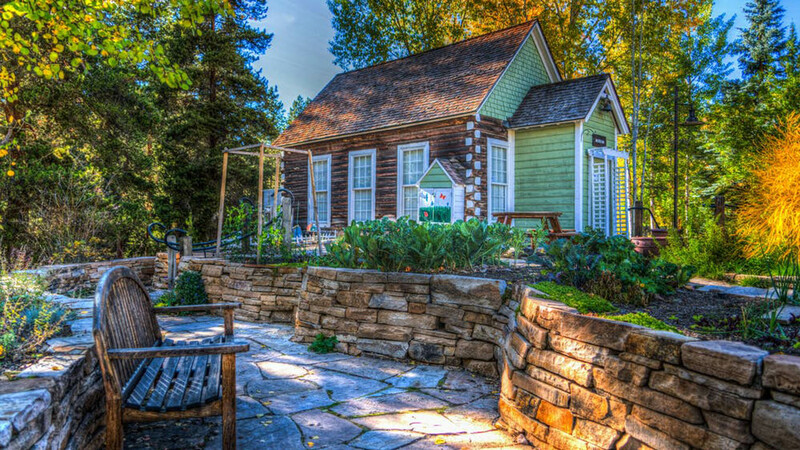 Should you simply give up on the garden of your dreams? At first glance, it may seem that a small garden has limited prospects, but with the right planning and thoughtful design you can maximize the potential of your small garden and transform it into a wonderful environment filled with character and color. In this article, we bring you 15 top tips to help you make the most of a small garden all year round. While bright colors like reds and yellows can make your garden attractive and intimate, lighter colors like blues, purples, and whites will give the effect of expanding space, which is perfect for small gardens. When choosing your flower species, consider hydrangea, lilies, and lavender to give the impression of a bigger garden. Arranging a smaller variety of many plants in a particular area is also very effective since individual colors will stand out. This method can create spectacular focal points in your garden, while being much easier to maintain. When choosing which plants to grow where, keep in mind that some plants grow better together than others. Species such as tomatoes and lettuce grow well together since the tomato plant allows ample space close to the ground for lettuce to thrive. Tomato plant leaves can also help shade crops which prefer conditions away from direct sunlight. Radishes and carrots are also good companions since they have differing harvesting times. This means you can cut away your radishes before uprooting your carrot harvest when it’s ready. There are many such examples of companion crops which help you to maximize your growing potential. If you’re not sure where to start, this book is a great beginners guide. No matter how small your garden is, you’ll always have the option of growing vertically. Just as you decorate the walls of your home with art and picture frames, making use of containers and hanging pots on your garden walls will expand your available growing space. There are many types of crawling plants that can be encouraged to grow along walls or fences. Creepers like star jasmine are beautiful and plush, while geraniums tumbling from hanging baskets give a striking effect. Furthermore, if you’re interested in growing food in this way, there are many species which will flourish on a vertical surface. Climbing beans and vining tomatoes will thrive in hanging baskets, while strawberry plants can be easily manipulated to grow along walls and other structures. Along the theme of growing food, if you have limited space, it’s smart to prioritize fruits and vegetables that provide a high-yield. Tomatoes, radishes, courgettes and chard are just a few examples of plants that either yield a lot of fruit or can be cut over and over again during the same growing season. If you enjoy using herbs, varieties like mint and basil are great choices. Herbs are best cultivated in individual pots thoughtfully arranged around your garden, though, rather than within your flowerbeds. When it comes to maximizing a small garden, scale is very important. If you choose the wrong plants, you could find your garden becomes swallowed up as they grow. If you do it right, choosing the correct species and arranging them appropriately can create the illusion of a larger garden. The best way to achieve this is to balance the size of the plants in your garden. Limit larger and taller breeds as much as possible, and surround them with medium-sized, shrub-like flowering plants which are easier to control. The smallest varieties should be scattered among the flowerbed or delicately outlining the edges. This combination of cleverly arranged sizes will create a feeling of depth that makes your garden appear bigger. Planting in raised beds is an easy way to expand your growing space. If you are clever about the species that you select, your plants will grow up out of the raised platform and then cascade elegantly down the sides. There are many styles of raised beds from which you can choose. The best one for you will depend on the look and feel you wish to create in your outdoor space. From corrugated steel and truck tires to wood planks and milk crates, there is an option to suit every taste. If you’re short of seating, raised beds can be slightly extended at the sides to create a space-saving bench. Small gardens usually exist in urban areas and can easily be overlooked by neighboring houses. To combat this, consider growing shrubs or hedges strategically to allow you to enjoy some private space. Planting some tall trees will create a canopy of shade and bring extra privacy. You may also wish to keep garden seating in these areas to allow you to enjoy your outdoor space in peace and away from prying eyes. If selected with a little thought, hedges and trees can have a multipurpose effect that is critical in small spaces. Geometric patterns and bold shapes like squares and triangles are desirable in small spaces. Using clean angles for patios, flower beds or pathways can keep your small garden space looking crisp and tidy. It may be tempting to go for curves and softer edges, but for small spaces this can sometimes appear messy and crowded. The angles of geometric shapes will become naturally softened by your plants and flowers as they grow. This contrast will give an attractive feel to your garden and keep a small space looking trim and organized. Moreover, simple tricks like paving a garden path diagonally can give the illusion of a wider and longer space when compared to paving in squares. Lighter colored paving stones will also make your garden look bigger while also giving it a stylish and modern feel. Warm and layered lighting helps to create dimension and make your garden feel welcoming no matter what the size. This is particularly important in northern regions where winter days are very short and you have fewer sunlight hours in which to enjoy the outdoors. Be sure to illuminate any focal features such as water fountains or raised flowerbeds. If you have any steps, small lanterns are an attractive way to add lighting without overwhelming the space. For hedges and fruit trees, draping delicate string lights around them is a practical way to add some charm. When designing a small garden, try to stick to a small number of materials and textures that complement each other. Too many materials can overwhelm the space, making your garden look cluttered and cramped. The ‘rule of three’ is a great place to start. For example, when selecting your flooring, focus on sandstone, grass and gravel only. This will help keep your outdoor space looking modern and tidy without creating a mismatch of confusing textures. The rule of three also applies to the number of plants and flowers in a particular area of the garden. Choose a strikingly colored species and arrange them in three plant pots aligned next to each other. This simple method is very effective at drawing the eye and adding a colorful pop to your outside space. Whether you go for traditional outdoor furniture or a more rustic look with stone or wooden benches, the right outdoor seating can transform your small garden into something enjoyable for all the family. No matter what the style, it’s important to avoid large and bulky seating. Instead, consider purchasing a lightweight bistro set of table and chairs. These will provide a comfortable place to enjoy your garden, without consuming all your open space. Alternatively, layered decking or large stones can offer a place to put potted plants as well as somewhere to sit and enjoy the view. While the idea of a focal point for your garden may seem like something suited to larger landscapes, having a stand-out feature is a wonderful way to inject character into a compact garden space. From water features to trees, there are many potentially stunning options to choose from. How about a bed of striking flowers? A birdbath or a compact water fountain? Placed strategically near some outdoor seating, these features will give your small garden added wow factor. If you live in a region with short summers, you may want to consider the view of your garden from indoors. This is also a great way to invite the outdoors in if your garden is simply too small to accommodate outdoor seating. First, study the perspective from your windows, making a note of which areas hold the most potential. Then choose a focal point around which to arrange your flowers and features. A quaint little birdbath or decorative sundial are both great options for small spaces. Taking the opportunity to utilize window boxes will provide you with additional growing space to enjoy. In a similar way to vertical growing, window boxes allow you to conserve limited ground space, while still creating an eye-catching garden. When creating your window boxes, pack them as closely as you can with colorful varieties of flowers. If you leave too much space between each plant, your window box will take on a patchy appearance and will draw all the wrong kind of attention. Cascading species are a particularly beautiful choice for window boxes, as the vibrant trails give the impression of harmony between your property and nature. Just like any other botanical feature, however, you’ll need to make sure your window box receives adequate sunlight to support growth. It may seem counterproductive, but a clever way to create the illusion of additional space is by compartmentalizing. This traditionally Asian method involves dividing your space with natural screens, such as bamboo, to segregate areas for different purposes. Because you cannot see the whole area at once, compartmentalizing forces you to move around to experience everything – thus giving the impression that your garden is much bigger than it is. In one area you could plant vegetables and herbs, another could contain a relaxing seating area, or hide a beautifully arranged flowerbed or tool storage. This style of small garden is perfect for children, who’ll love playing and exploring in each space. As we have seen, no matter how small your garden, there are many things you can do to maximize your outdoor space. Selecting vertical climbing plants, making use of hanging pots and window boxes, or installing raised flower beds will all help increase your growing potential. Moreover, dividing the garden into cleverly designed sections will create private areas and help give the illusion of a bigger space. As long as you plan carefully and keep on top of maintenance, the above tips will help you create a beautiful compact garden that will provide enjoyment for years to come.